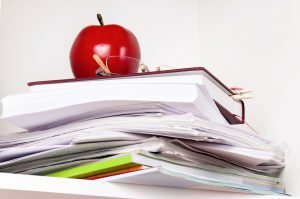 Home / Blog / Head teachers, are you drowning in paperwork? Remember the days when teachers set their pupils’ teeth on edge writing with actual chalk on dusty old blackboards? When the kids wrote out their lines in simple manila covered exercise books, correcting their mistakes with Tipp-Ex? Ah, those were the days, eh? Or maybe not. There’s something to be said for modern school tech like interactive whiteboards and digital marking software. One of the things that doesn’t seem to have changed is the amount of paperwork hanging around though. In fact, it may well be getting worse. Some pupil records need to be kept for years, even once they’ve graduated. And that’s before you start on curricula, teaching notes, reports, employee records and the rest. So what’s the answer? Well, you could stop letting new pupils in and just wait it out until your current records are old enough that you can get rid of them. But that’s probably not all that practical. Or your could build a new wing to house the endless box files that are currently threatening to breach health and safety regulations. Though that might be stretching the budget somewhat. The best answer, as you may already have heard on the grapevine, is to go digital. First, we’ll come and visit you so that we really get to know what it is that you need. We don’t do off-the-shelf solutions; they just don’t work properly. Next, we’ll take a sample of your paperwork and provide you with an example of what we can do for you. At no charge. If you’re happy, we’ll collect your paperwork so you don’t have to lift a finger, and get it all scanned on our really rather snazzy machines. The data will then be indexed as closely as possible to your original system, so it’s really easy to access. We can even provide staff training on how to use the new digital archive, in case there are a few technophobes you need to convince. Oh, and then we can either store the originals in our climate controlled, 24-7 monitored storage units (with fast retrieval services available if you need them), or if they’re surplus we can destroy them securely and in compliance with data protection legislation. So there you have it. Not quite so alarming, is it? If you’re thinking of going digital, this is a great time to do it. With the children off gallivanting on the beach / cruising the shopping malls / sleeping in until mid-afternoon, the school should be nice and quiet. Perfect for a little light paperwork. Just imagine going back in September and being able to get hold of little Johnny’s report from year 2 Geography at the touch of a button. Now wouldn’t that be nice? For help getting your school’s paperwork under control, contact the genuinely friendly Scan Film or Store team today for a chat.